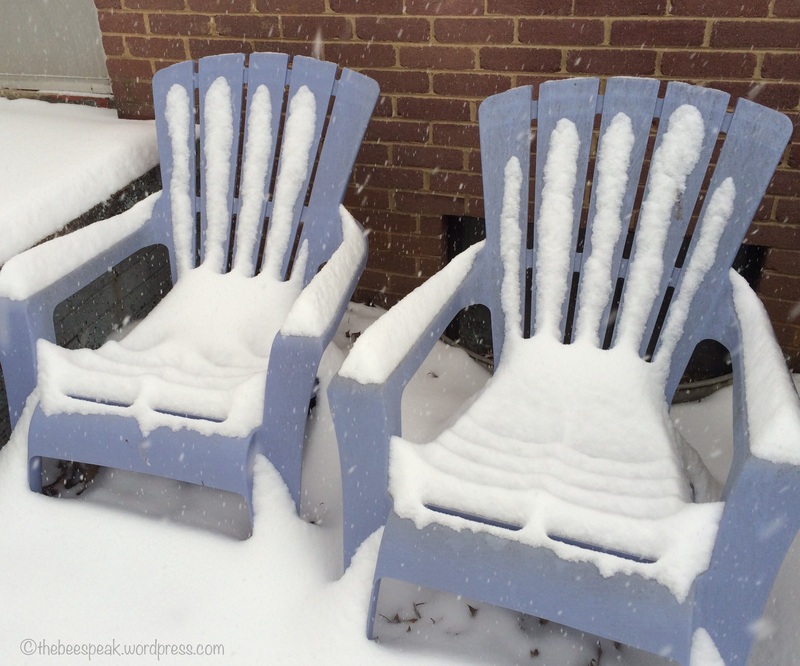 These snow-cushioned seats offer cold comfort to winter weary bones! 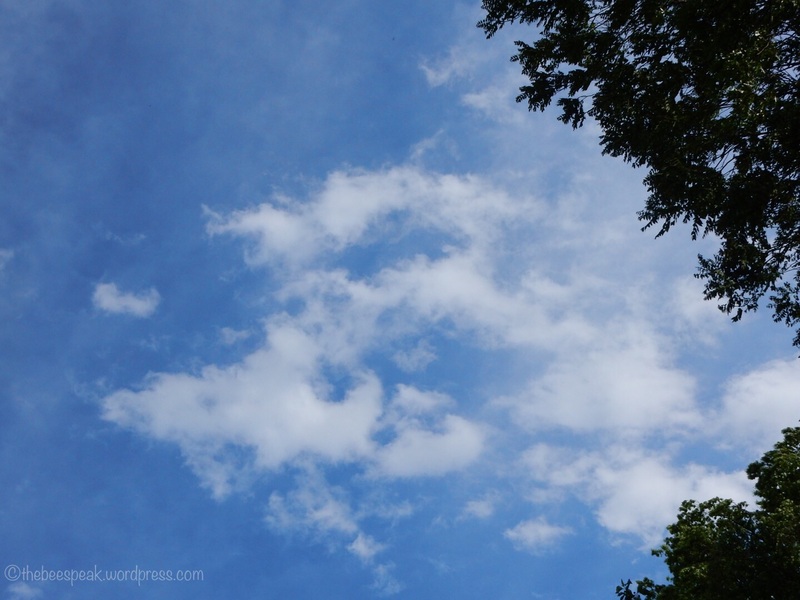 Thank goodness this photo, posted for JNW’s one word photo challenge, is from my archive. My personal preference is for sun-warmed seating, courtesy of spring! 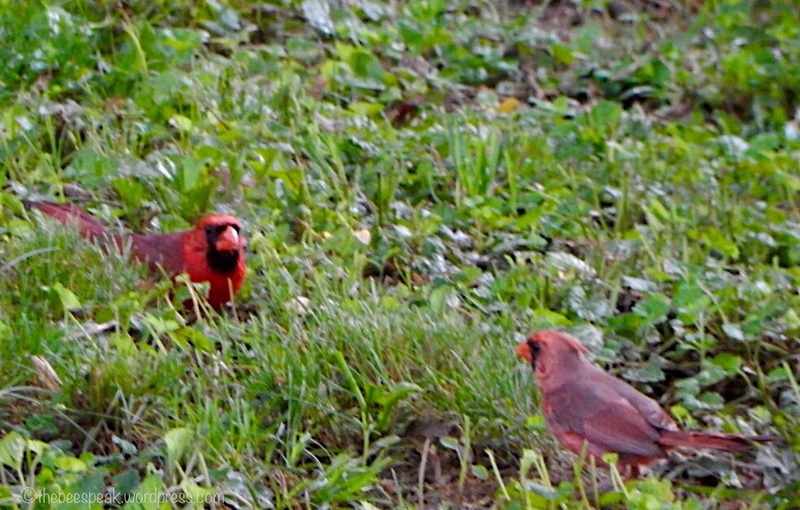 Each of these redbirds is colorful. Male cardinals are a vibrant red. They were both fluttering about each other in what seemed to be a dance. When they landed, I was able to capture them together, their eyes locked in a steady gaze. Cardinals have built a nest within the honeysuckle vines along my fence. 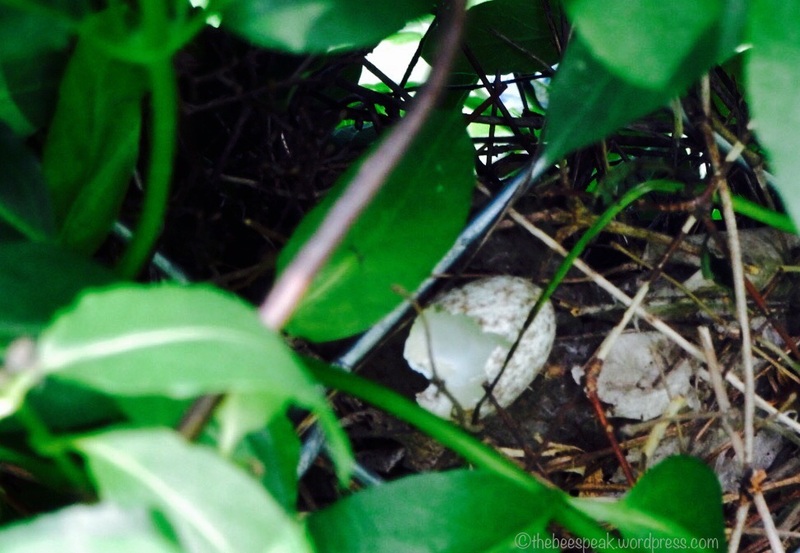 Yesterday, I posted a picture of a speckled eggshell, open and empty. I am on the lookout for baby birds. The bright red cardinal is a beautiful sight to see. The cardinal happens to be the state bird of Virginia, where I live, so I am fortunate to frequently witness their flight. Still, I don’t take this view for granted. I can’t seem to stop myself from announcing “Cardinal!” at the sight, even when I am the only one around. Do you have cardinals where you live? 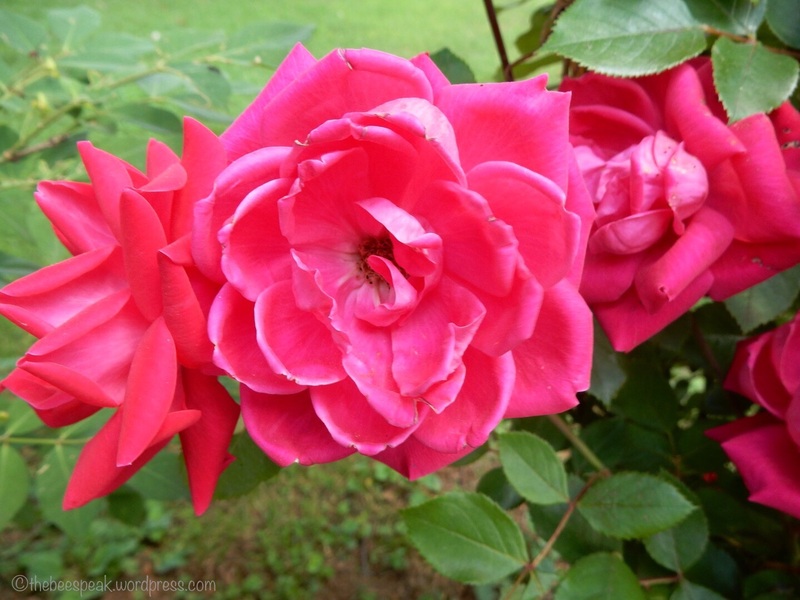 Hot pink roses beckon with beauty and heated aroma at midday. Thank you! This was a great challenge theme and I really enjoyed all the entry posts! Thanks to A Momma’s View for hosting the challenge. Congrats to you, Pensitivity! I hope everyone gets a chance to chill out in nature this weekend! Thank you all very much for participating. I hope I will come up with another challenge soon. I think that was it for the Nature Chills Challenge. Three rounds is more than enough. Business at the Country Market seems to be booming. Seeing so many beautiful plants and flowers outside of the store seems to draw customers into the parking lot for a closer look. I have stopped by several times to buy home-grown tomatoes and have been thinking about buying some tomato plants. While in the store, I wandered around to look at the wares and made a mental checklist of things I might go back to buy. Every time I explore the market and greenhouse, I start thinking that I should cultivate a green thumb. Maybe someday I will. This is my fifth installment for Cardinal Guzman’s Monthly Photo Challenge. We are to post 5-20 pictures each month at a nearby location to showcase the changing of seasons and hone our photography skills. You should check out his photos and the links that he posts to other entries you may also enjoy viewing. You can see my previous galleries by clicking on the Changing Seasons header at the top of this page. Does anybody else see a smiling face? I also see a dolphin! It’s funny how we all see different things when we gaze at the clouds. Maybe, what we see is dependent on our mood or our experiences. Maybe, we see what we want to see. I’m curious. What do you see in these clouds? This tiny sprout is a force to be reckoned with. As a kid, I called it a stinkweed tree because of the strong smell of the leaves. Later on I learned it was also called a tree of heaven. 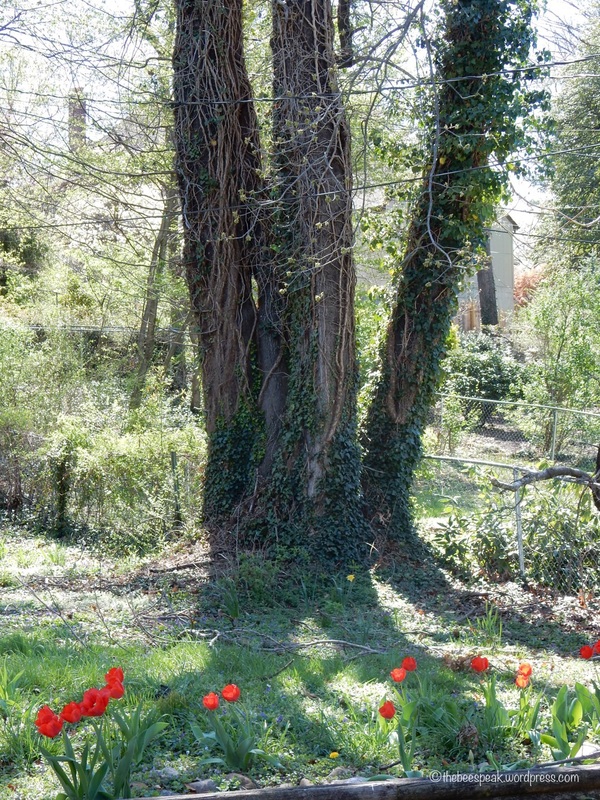 These little sprouts spring up all over and can easily take over your yard. They are a force to be reckoned with. Here is an example of how big these trees can get when they are allowed to grow. They can look pretty, almost tropical, but can grow out of control. My little stinkweed popped up in a small space between my house and back porch. I kind of hate to pull it out, but I know I must. At least it has had it’s photographed moment of glory. 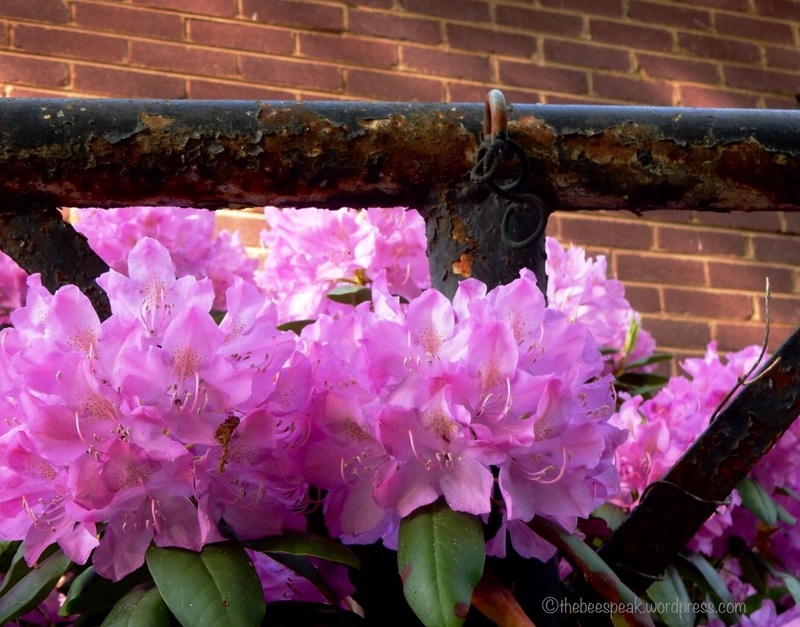 Yesterday, When I saw that Lucile’s Photo 101 Rehab and Perelin Colors Tech Challenge included capturing photos in the last beams of sunlight, I went outside to take a picture of my rhododendron. I had just enough time to take a single picture of the plant in full bloom before a big rainstorm came through (in fact, my power was off for almost four hours!) I had already taken pictures across a few evenings to show the plant’s changes. Tonight, I went out to look and saw this bumblebee buzzing between the flowers as the sun lowered in the sky. The setting sun shines on the corner of my house. 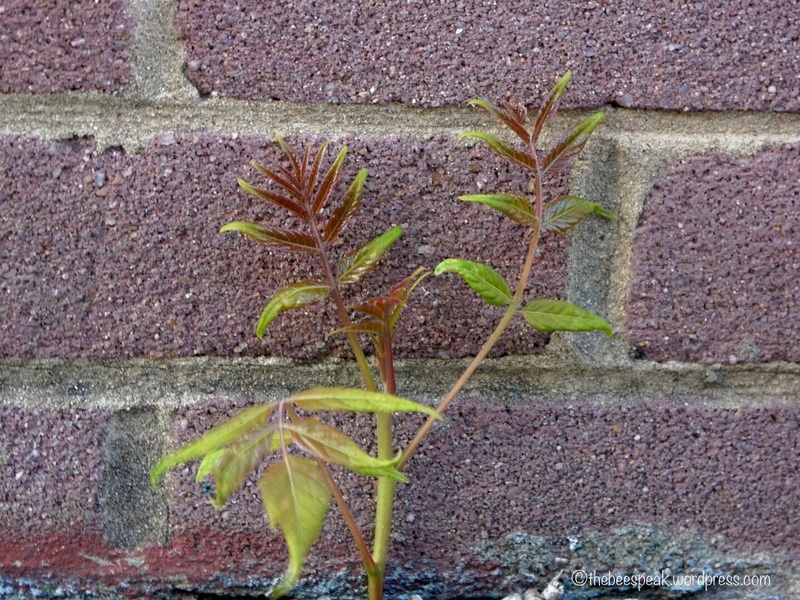 I like the way the plant filters the evening sunlight and I like the way the sunlight dances across the brick. I find it interesting that the color of the flowers is affected by the lighting too. Are they purple or pink or something in between? I hope you like rhododendrons because I just kept taking pictures! I used my Nikon Coolpix S9900 and made a few adjustments with the camera + app. I think the pictures are pretty, but I’m not sure photos can ever capture the full natural beauty of the flowers.